Born at Rivière du Loup on 23 July 1823, a son of Charles Taché and Henriette Boucher de la Broquerie. His father died when he was two years of age and his mother moved her family to Boucherville. Taché claimed descent from both Louis Joliet and Pierre Gaulthier Varennes de la Vérendrye. He was educated at the College du St. Hyacinthe and at the Montreal Theological Seminary, from which he returned to teach mathematics at the College de St. Hyacinthe. In 1844 he entered the Oblate novitiate at Longueuil, leaving it on 24 June 1845 to travel westward in a birch bark canoe with Reverend P. Aubert. They arrived at Red River on 25 August, and Taché was ordained deacon the following Sunday, 31 August 1845. On 12 October, he was ordained priest by Bishop Provencher. In 1846 Taché and Father L. Lafleche, later Bishop of Three Rivers, journeyed northward to establish a mission at Ile-à-la-Crosse, whence Taché made expeditions to Caribou Lake and Lake Athabasca. In 1851 Bishop Provencher chose Taché to be his Coadjutor and successor. Taché journeyed to France and was consecrated Coadjutor Bishop on 23 November 1851 at Viviers, in southern France, by Mgr. Mazonod, Bishop of Marseilles and founder of the Oblates of Mary Immaculate. The new Coadjutor returned to Ile-à-la-Crosse in 1852. Bishop Provencher died in June 1853, but Taché was not installed as Bishop at St. Boniface until 5 November 1854. As Bishop his energies were devoted to extending missions throughout the whole of central British North America. 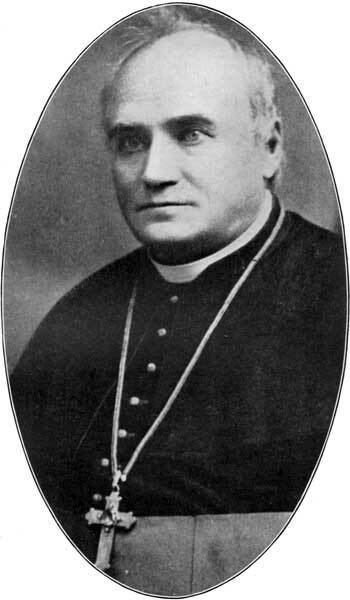 His success was demonstrated by the growth of his enormous diocese and its division in 1860, when the Athabasca and McKenzie districts became a vicariate apostolic. In September 1871, Taché became an Archbishop when St. Boniface became a metropolitan diocese, including the bishopric of St. Albert and the vicariates-apostolic of British Columbia and Athabasca-MacKenzie. In 1869 Taché journeyed to Rome to attend the Vatican Council. At the request of the Canadian government he hastened back to North America, first to Ottawa and then to St. Boniface, in order to exert a pacifying influence on insurgent Red River. He acted as an intermediary between the Provisional Government, led by Louis Riel, and Sir John A. Macdonald’s cabinet, in establishing the terms of the Manitoba Act and arranging the union of Rupert’s Land into the Canadian Confederation. In the years after 1870 he unsuccessfully attempted to secure an amnesty for Riel which he believed had been promised him by Macdonald. At the same time, he recruited a large number of Francophone professionals to attempt to give some substance to the guarantees of bilingualism and biculturalism in the Manitoba Act. Throughout the 1870s and 1880s Taché laboured to establish Roman Catholicism throughout the Canadian west. He also strove to encourage the westward migration of French Canadians from Quebec. The last years of his episcopate were devoted to opposing the abolition of separate schools and the suppression of the official use of the French language in Manitoba. He wrote a number of books, including Vingt Années de missions dans le Nord-Ouest de l’Amérique (1866) and Esquisse sur le Nord-Ouest de l’Amérique (1869). He died on 22 June 1894, after suffering an increasing measure of ill-health during the previous fifteen years. He is commemorated by Tache Avenue in Winnipeg, the Tache Building at the Fort Garry campus of the University of Manitoba, a cairn in La Verendrye Park in Winnipeg, and the Rural Municipality of Tache. His residence in St. Boniface, built in 1864, is identified by a commemorative monument. Vie de Mgr Taché by Dom Benoit,2 volumes (1904). Alexandre-Antonin Taché, Dictionary of Canadian Biography XII, 1,002-12.